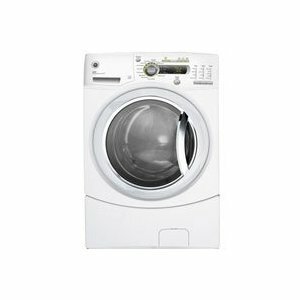 The GFWH2400LWW is a 27" front-load washer manufactured by GE with 4.9 cu. ft. capacity. Among its features is the AVC or Adaptive Vibration Control which reduces the sound and vibration produced by the washer, making it operate silently. It also has an eWash option that utilizes cold water for a number of cycles, which saves energy without sacrificing quality. Speaking of energy savings, the GFWH2400LWW is ranked in the CEE Tier III of Energy Star which means it meets federal guidelines for energy efficiency. You are assured that this model maximize energy use which in turn gives you a lighter utility bill. The HydroHeater with Sanitization is an internal feature that heats water to be used for washing, making whites brighter and at the same time helping get rid of common bacteria that may contaminate your laundry. Special cycles The washer is also equipped with special cycles to match certain types of loads. For example, stained clothes can be treated with the stain wash cycle that fights even the toughest stains for thoroughly clean laundry. If you are in a hurry, you can use the Speed Wash cycle to provide your lightly soiled items a quick but effective wash.
an automatic Adaptive fill feature that ensures water to be used for a load is the right amount and not over or too little. Among the washer’s exterior features is its organized washer controls, located at the upper portion of the washer’s front face. There is a digital cycle countdown shown on the LED screen to inform you of the time remaining on a cycle, letting you do other things for the meantime. Other tools that inform you of what’s going on in your washer are the cycle status lights and adjustable end-of-cycle signal. There’s also the child lock safety feature that doesn’t permit accidental opening of the machine by children especially when it is in use. The White on White appearance of the machine give it a very clean look, in anticipation of how clean clothes are once they’ve been washed by the machine. The see-thru glass door also gives you a peek on what’s going on in the interior of the washer while it is in use. The door also has a dark chrome TrueGrip handle which is easy to clean and maintain. The washer is equipped with 11 wash cycles to fit any type of load placed in the machine. The Timed Flow-Thru dispenser mechanism is present in detergent, fabric softener and bleach, assuring you that these implements are added at the right time in the cycle at the right amounts. The Adaptive Vibration Control mechanism makes sure that the machine provides optimum performance with the least amount of noise and vibration possible. Spin patterns are optimized and adapted to lessen vibration and sound so as not to disturb everyone's peace while doing the laundry. The eWash Option is another mechanism that lets you save on energy with the use of cold water on some cycles. You need not worry about the quality of washing as the machine still upholds the high standard even when using cold water. The absence of some options and features such as the lack of a reversible door, self cleaning lint filter and soak setting may not appeal to users who prefer these traditional features.